Securing land is difficult for young farmers, particularly in Marin County, where farms often pass from one generation to the next without going on the market. Jesse Kuhn found his first plot of land 12 years ago by posting an ad in the classifieds section of a local newspaper. Later, he had the good fortune to secure another piece of land in Hicks Valley, about 10 miles west of Petaluma, where he still farms today. When he founded Marin Roots Farm, Jesse bought his seeds and equipment on a credit card. The interest rate started at 10%, and then it shot up to an unmanageable 30%. Luckily, he was able to get a low-interest loan from the USDA’s Farm Service Agency, which helped him reduce his credit card debt and avoid bankruptcy. “That first loan got the farm started,” said Jesse. Today Jesse farms along with Moira Firmin and a lean crew of workers on 60-acre plot, with 30 acres of fields and the rest as two large ponds. The cost of leasing in Marin County varies widely, and while some ranches pay only $50 per acre, Marin Roots pays $1,000 per acre per year for their irrigated land. Marin County is one of the most difficult places in the Bay Area to grow row crops because the land is hilly, better suited for cattle ranches than crop farming. Hicks Valley is one of the few areas with flat land. 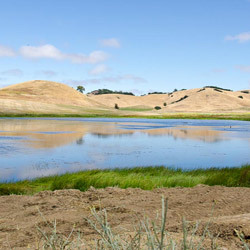 Marin County has limited well water, so the ponds are crucial to the farm’s success. Hicks Valley, which gets less fog than other valleys in the area, has a cup shape, ideal for collecting rainwater. The ponds are filled by rain running off the hills surrounding the valley, and just one large storm can be enough to fill the ponds. This year, the ponds were dry until rains came in February and March. The farm can’t plant their fields if the ponds are dry, because the farm’s lease prohibits planting crops without water to irrigate them. As a result of the late rains, Jesse had to plant four months later than usual. Marin Roots shares water with a cheese maker located on the same property. The owner and Jesse are working together to increase the storage capacity of the ponds, so that they can collect more storm runoff and reduce loss from evaporation during the summer. Marin Roots uses drip irrigation in their perennial crops, like herbs, but not on their annual crops because the light, thin tubing tends to rip easily when moved during the growing season. They irrigate their annual crops with a network of light aluminum pipes, which requires 12 hours of work by a crew of four to set up in the spring. The crew works long hours during the summer, from 5:30 a.m. to 9:45 p.m.
Jesse and Moira farm with ecology in mind, and the farm is certified organic by Marin Organic Certified Agriculture (MOCA). Although certification involves a lot of paperwork, Jesse thinks it is worth the time and effort to assure his customers that he is following organic standards. They plow the land only once in the spring to break up soil that has gotten compacted over the winter. Repeated plowing tends to damage soil, creating hardpan that is difficult for plant roots to penetrate. To prepare a field for planting, they mow the weeds and then disk the soil with a tractor to break up only the top four inches. The farm’s biggest expense is weeding, which is not only time-consuming but also tough on workers’ bodies. To reduce weeding time, the farm has recently started flame weeding to burn the weeds. Moira and Jesse put a lot of effort into finding interesting, unusual crops to grow and sell. At the end of December, when the weather is (usually) rainy, Moira is buried deep in seed catalogs. When choosing varieties, she focuses on taste, color, viability in the farm’s microclimate, and customer feedback. This season they planted 25 varieties of winter squash and will be looking at how well they grow, resist insect damage, and ship, as well as how chefs and other shoppers respond to them. Marin Roots grows crops from open-pollinated seed, which yield crops that are less uniform and predictable than those grown from hybrid seeds. “We get all sorts of sizes and colors from the open-pollinated seeds, like a gorgeous purple kale,” said Moira. Open-pollinated seeds rely upon pollinators, so Marin Roots works to create an environment where pollinators can thrive. One of their more popular crops right now is sunflower buds, which Jesse said they discovered through “a happy accident.” They planted sunflower seeds, planning to sell sunflower sprouts, but the plants grew more quickly than expected. The buds quickly gained popularity with restaurants, and this summer, the farm planted a whole field of sunflowers to meet the demand. The sunflowers provide shade for the farm’s other edible flowers. Six years ago the farm grew only two types of edible flowers; now they grow 12. 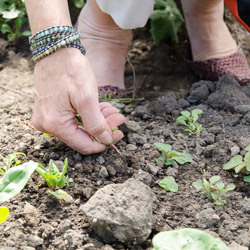 Marin Roots is also known for selling edible weeds like purslane and chickweed. “The foraged plants really help carry the farm through times when we are not selling our field crops,” said Jesse. The farm’s five-year lease is expiring soon, and ideally Jesse and Moira would like to establish a long-term lease or to purchase a portion of the land. This stability would allow them to invest in making improvements to the farm like building a semi-permanent greenhouse in which to start seeds to transplant into the fields. Look for Marin Roots Farm on Saturdays at the Ferry Plaza Farmers Market.